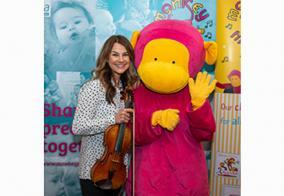 The grand finale of the event saw Angie Coates, Monkey Music Founder & CEO, announce a partnership with Izzy Judd, musician, author, wife to Harry and busy mum, who also attends Monkey Music classes in London. Izzy spoke about her own musical life and how she truly believes in the power of music and the value of an early music education. We're thrilled to be working with Izzy, watch this space!